Today was perhaps the easiest day of this month’s challenge. Because today is both World Nutella Day, and Chocolate Fondue Day (not to be confused with *Cheese* Fondue Day, which is in April, and if you don’t think we’ll also be celebrating that, then clearly you don’t know me at *all*). Seriously, these two could not have been planned better. And since Mondays are the worst day for me to try to do anything in general, due to work during the day and rehearsal in the evening, the combination was even better, because it went together in about two minutes, max. So…ready for this highly complicated recipe that combines both important celebrations? Here you go: 1/2 cup Nutella and 1/2 cup cream. Heat the cream, stir in the Nutella, serve with bite-sized items for dipping. 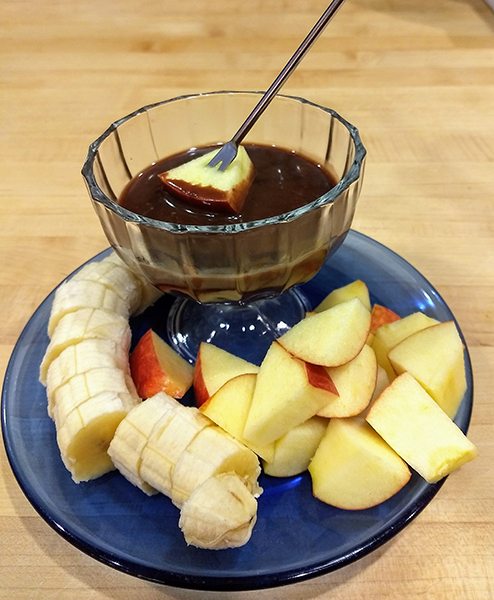 We pondered what to dip into our Nutella fondue, but decided fruit would make it feel more virtuous, so went with apple and banana. Also pretty much the only way I will ever voluntarily eat a banana is if it can be smothered in enough chocolate so that I can’t actually *taste* it, so bonus for getting my annual ‘I suppose I ought to eat a banana’ day out of the way early for the year!